I for one, am not a big fan of the holidays and am glad Christmas is over. When corporations and large businesses stand to profit and benefit most from a holiday, it can't be a good holiday. Not to mention the amount of waste associated with certain holidays, especially Christmas. Christmas is a time of waste. Everyone puts of their lights and wastes electricity needlessly. We wrap presents in wrapping paper that most of which will end up in land fills, as well as the packaging that the presents already comes in. There is lots of extra driving associated with buying Christmas gifts because you end driving everywhere to find the gifts you want to buy. It wastes gas, extra money, and time since you are not only just shopping, your battling against everyone else who is doing the same. And we also chop down trees that are tossed out after the holidays are over. All because of a holiday. Christmas was never actually even about Jesus. The catholic church had actually banned Christmas because of it's origins and because they also saw that it was a wasteful holiday. 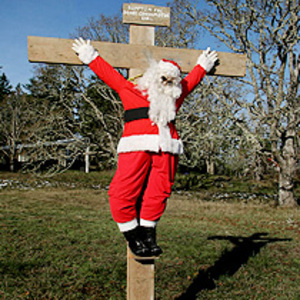 The unbanned it because they realized it could be associated with Jesus and promote Christianity(http://en.wikipedia.org/wiki/Christmas). It flourishes now more than ever because of corporations and big businesses promoting it because they stand to profit from it. I know people love to receive crap they won't use more than a few days in most cases, or things they may not ever use. Everyone likes to receive gifts. But the idea of receiving a gifts because it's a holiday diminishes true generosity and replaces it with the idea that you have to give gifts. If you don't give certain people a gift on Christmas, they often think you either don't care, or in cases of significant others, that you don't love them. Worst of all, if you don't give anyone anything, you are can be considered a thoughtless greedy person(which helps corporations a lot by further promoting buying things). I believe that gift giving and showing generosity should be a year round, non-holiday specific event. If you are willing to give someone gifts when it is not a holiday, or during birthdays and other events of such, wouldn't that gift be that much more meaningful? I no longer buy people gifts for holidays and tell people not to get me anything either, as well as encourage others to follow me in this. We should celebrate the holidays for what they are meant to be, not what corporations and big businesses tell us we should. Avoid the materialism they promote. 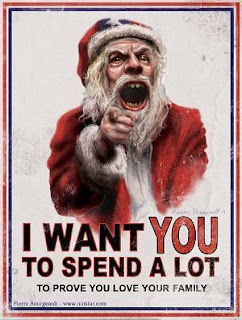 Take the time off work rather than working during the holidays to pay for what you bought. Spend the holiday with friends and family. Consider these ideas next year. I'm glad it's done too. Now on to the constant weight loss ads yippee!! I remember when Santa died for my sins. WWSD? we just celebrate it like any other public holidays, no difference here. Need something to break up winter. I'd move the p1ss-up to end Jan, early Feb though.